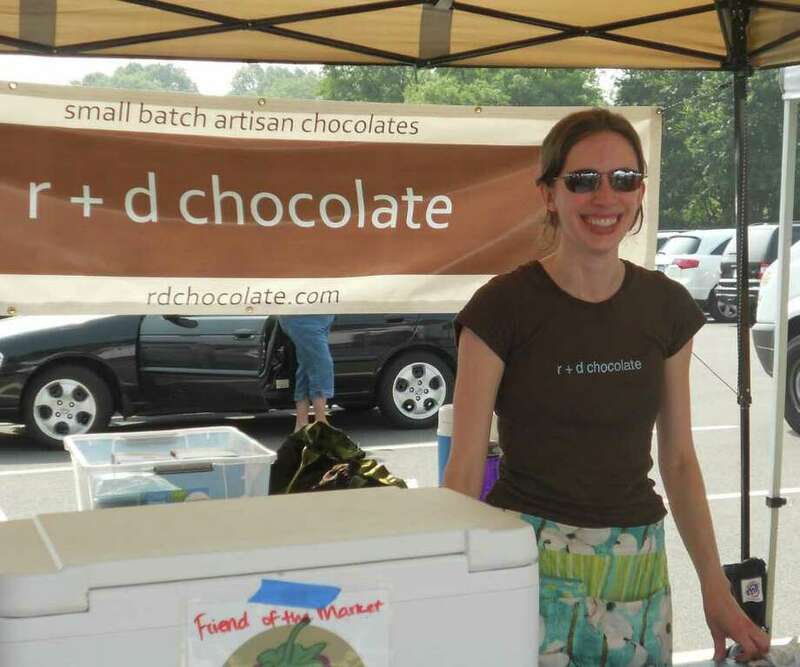 Rachel Gordon of Southport sells her R & D Chocolate confections at the Westport Farmers Market on Thursdays. With a doctorate in bioengineering, Fairfield resident Rachel Gordon is putting her degree to good use. No, she's not inventing new medical devices or cloning DNA. Instead, she's doing something that has a direct impact on many people's lives, she's making chocolates. R + D Chocolate, is a nod to both her background in research and development, and its name is a combination of the first initials of the first names of herself and her husband, David. While she did go the scientific research route for a while, she discovered that it wasn't the right fit. "I was too nervous, wearing the gloves and masks and goggles," Gordon said. "With chocolate, you still wear the gloves, but it's not the end of the world if you spill something." Gordon said she has always loved to cook, and at one point became obsessed with creating the perfect chocolate cupcake. "I made batch after batch," she said, using her husband as a taste-tester. Eventually her focus turned to chocolates. "Making chocolates is a lot like chemistry," Gordon said. Those who have worked with chocolate know that it is a very temperamental ingredient to work with. "I've been very lucky because it all came so naturally," she said. "I'm used to being precise." Gordon works out of a kitchen that she rents in Westport, a practice that is becoming more and more popular with small gourmet companies. For her chocolates, she uses two brands: Guittard 72 percent dark, which she uses for her flavored chocolates, and Valrhona 72 percent dark, which she uses for the plain ganache. "I find the Valrhona more defined and flavorful, and I've always liked Guittard," she said. Her flavored chocolates vary according to the season and what's available. 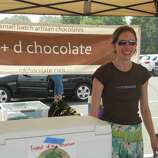 She sells her chocolates at the Westport Farmers Market, and has collaborated with several of the vendors there. For instance, one of the owners of Two Guys from Woodbridge suggested their chocolate mint (an herb) to flavor her chocolates. She tried and had success. Now, with raspberries in season, she's making raspberry ganache and is considering a blueberry one. Her regular flavors include Fleur de Sel caramels and coffee ganache, although she's had requests for a chili-flavored chocolate and more nut-based sweets. On a recent Thursday at the farmers market, Gordon gave out samples to visitors who dropped by her booth. Twelve-year-old Isabella Ullmann tried the raspberry ganache and said it was "really good." Her friend, Katherine Coogan, 12, sampled the mint. "It was really good. You could taste the mint," she said. "It tasted like fancy chocolate." Gordon only sells her chocolates at the farmers market and through special orders, although she used to sell them wholesale to coffee shops and stores when she lived in Pennsylvania. The farmers market experience has been wonderful, she said. "I'm having the most fun. Now I get to watch people eat my chocolates, which makes me so happy." Email Patti Woods at eatdrinkshopcook@gmail.com. Chocolates available at the Westport Farmers Market, 26 Imperial Ave., on Thursdays, 10 a.m. to 2 p.m.